Our company is well-reputed as one of the eminent Idlers Manufacturers and Exporters from India. The array of the Conveyor Idlers offered by us includes carrying idler, the return idler, the impact idler, the centring idler, the spiral idler, the idler with rubber rings, etc. meeting the requirements of the applications. Moreover, the Industrial Conveyor Idlers possess minimum revolving resistance, long life, small maintaining work, high carrying capability and around 50000 hours of working life. Using the international standard design and manufacturing technology, our company improves the production and design of idlers to a higher level. The idler produced by our company enjoy min.revolving resistance, long life, small maintaining work and high carrying capability. The company adopts special fine welding steel pipe for idler, and does puncture processing in the tube. The roundness is controlled in special tolerance scope. The axle is according to standard tolerance and manufactured by fine cold drag steel. The bearing housing has been manufactured after stamping many times by the imported cold griped steel. The idler shell and bearing housing have been welded together by the automatic welding machinery hand. Then it forms a whole high strength structure. 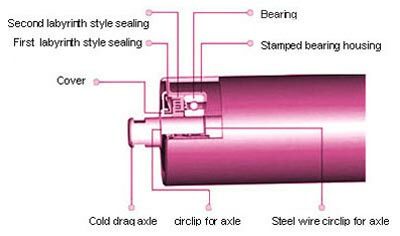 The bearing, which uses the world famous brand, is the big roving crack, deep groove ball and double sealing bearing. It makes the idler has the ideal static and dynamic balance that is better than the national standard. The company has done the special design and formed a particular our company seal way after integrating the overseas and domestic labyrinth seal style. It is filled with resisted high speed, high temperature and ultralow temperature antioxidant lithium. So it prevents the corrosion of the impurity, the water and the air effectively. The above technical conditions can guarantee the idler enjoy 50000 hours of working life. At present, the idler series products include the carrying idler, the return idler, the impact idler, the centring idler, the spiral idler, the idler with rubber rings, etc.